Why Simulate An ABI? Portability! The MPI standard specifies a programming-interface (API), not a binary interface (ABI). This API allows applications to be compiled against any (standard-conforming) MPI-implementation without any changes to the source-code. Once compiled against a specific MPI implementation however, the application also needs to be launched using the launch-scripts that come with this particular MPI-implementation. Switching to another launching-mechanism requires the user to relink the application to the corresponding MPI-library. In general, this re-linking is not possible without first recompiling the application, because different MPI-implementations are not guaranteed to be binary compatible. The MPI-standard specifies an API and not an ABI because, for instance, it does not define the layout of the MPI_Comm objects in memory nor does it define the exact value of MPI_ERR_COMM. The consequence of this design leaves plenty of flexibility (for optimization) to the MPI implementers. the interconnect for parallel (MPI) applications. The dependency on the interconnect for MPI-applications is due to the lack of an MPI-ABI. This makes MPI-executables even less portable than their sequential counterparts. Shrink-wrapped software is only available on a limited number of platforms which are selected by the application-developer. The HPC-world, in which MPI is mainly used, consists of many diverse platforms in contrast to the many X86 mainstream applications (e.g. office applications). Additionally, HPC applications are less portable compared to office-type applications: office applications do not care if they are being run on an Intel EM64T processor or AMD Opteron. HPC executables however, are generally not portable among these two processors because they would either exploit SSE3 or 3DNow instructions that are not supported by all processors. Because the application executables are linked to a specific MPI-library and run-time environment vendors find it difficult to provide shrink-wrapped HPC software optimized for the user's platform. The advantages and disadvantages of standardizing an ABI for MPI have been discussed for many times. During one of those discussion on the beowulf-mailing list, a solution was put forward to implement a library on top of the existing MPI-implementations that would be able to provide binary compatibility  which Jeff Squyres coined MorphMPI. 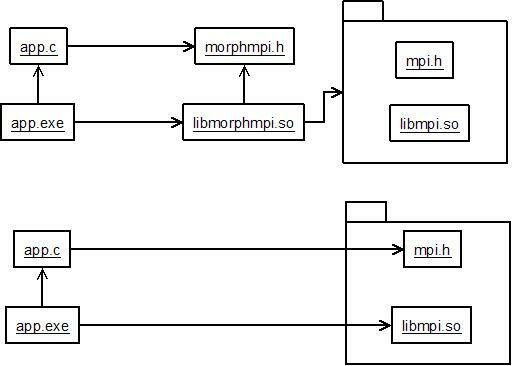 And because at Free Field Technologies  we regularly get requests to support yet another MPI-implementation, we finally decided to implement MorphMPI. All problems in computer science can be solved by another level of indirection (D.Wheeler). MorphMPI does exactly this. MorphMPI is a library on top of MPI. Applications using MorphMPI have no header-dependency on MPI and MorphMPI itself can be recompiled to use any MPI implementation. Thus object-code using MorphMPI can be linked with any MPI implementation. the equivalent MPI-function will be called with MPI_COMM_WORLD as first argument and a pointer to a new variable of type MPI_Comm. After MPI_Comm_dup returns successfully, a new MorphMPI_Comm will be created and mapped to the newly created MPI_Comm. Thus, the next time MorphMPI_Send is called with this new MorphMPI-communicator, MorphMPI will be able to translate it to the equivalent MPI-communicator. Same goes for the datatype that is used in the MorphMPI_Send while the other arguments are forwarded to the MPI_Send function as is. MorphMPI does not only provide an equivalent for the MPI C-interface but also the Fortran-interface. The Fortran interface is implemented in C and therefore relies on the C-interface of MorphMPI. This design ensures that MorphMPI should be able to translate the Fortran-specific constants such as MPI_COMPLEX in C. However not all MPI-implementations provide these constants in their C-interface.